“Art of Darkness,” a new show featuring images from the Dark Energy Camera, runs through April 29, with an artists’ reception planned for March 18 from 5-7 p.m. Imagine being able to see 8 billion light-years into space. Imagine feeling like you are near enough to another galaxy to count its spiral arms or close enough to a comet to reach out and touch it. Imagine being given a window onto the vast magnificence of the universe, without leaving Earth. 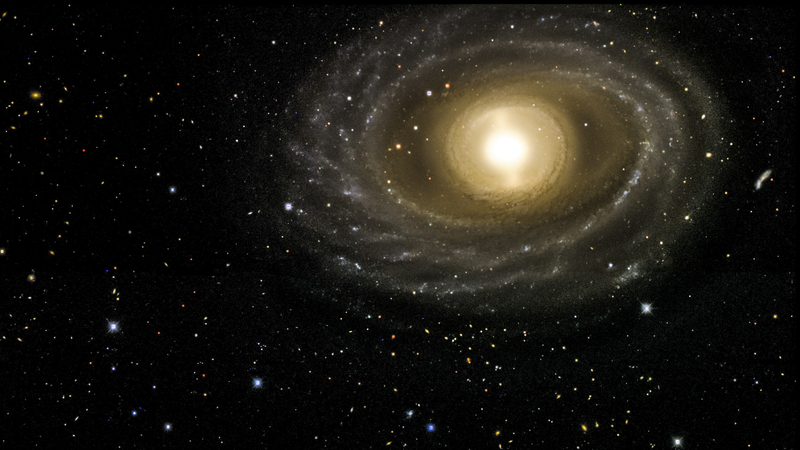 With the Dark Energy Camera, a stunning scientific instrument built and tested at the U.S. Department of Energy’s Fermilab, we can. Even better, we can capture images of the cosmos in digital quality. For the past three years, scientists have been using the camera, mounted on a telescope in the Andes Mountains in Chile, to learn more about dark energy, the mysterious force scientists think is pushing the universe apart faster and faster. In order to do that, scientists using the camera are taking some of the most breathtaking pictures of galaxies, nebulae and other objects ever seen. And now you can see them too, as the Fermilab Art Gallery presents “Art of Darkness – Images from the Dark Energy Survey,” a new show featuring images taken with the Dark Energy Camera. The exhibit features more than a dozen dazzling photos of stars, galaxies and celestial objects (including one comet that snuck its way into frame), alongside pictures of the Cerro Tololo Inter-American Observatory, where the camera lives.